Home/Investigators and Research Centers/Investigators/Linnea Goodman, M.D. Dr. Linnea Goodman is a board certified Obstetrician and Gynecologist at Reproductive Medicine Associates of New Jersey. Her area of specialty in the field of reproductive endocrinology and infertility includes minimally invasive hysteroscopic, laparoscopic and robotic reproductive surgery and serves as the medical director of the Ambulatory Surgical Center at Basking Ridge. Dr. Goodman earned her undergraduate degree in Biomedical Engineering with Honors from Columbia University, School of Engineering and Applied Sciences. From there she went on to pursue medicine at the University of Vermont College of Medicine where she received her medical degree and was awarded the Charles and Sylvia Schechtman Prize for Excellence in Clinical Care. 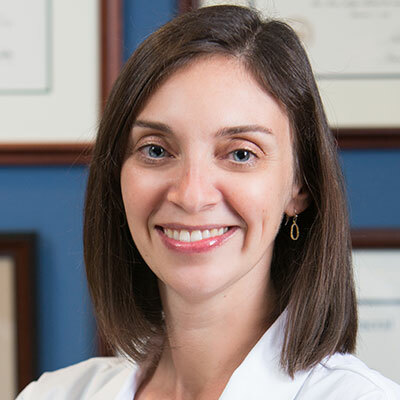 Dr. Goodman completed her residency training in Obstetrics and Gynecology at the University of North Carolina Hospitals where she received several prestigious accolades including the Golden Tarheel Teaching Award and the American Association of Gynecologic Laparoscopy award for minimally invasive surgery. Dr. Goodman then continued her training in Reproductive Endocrinology and Infertility at the Cleveland Clinic fellowship program. Her research during fellowship received national recognition earning her over $200,000 in research grant funding from multiple distinguished foundations. She has been invited to speak at several national conventions and has authored and contributed to numerous peer reviewed publications, book chapters, videos, and abstracts. As someone who has always loved math and science, Dr. Goodman is especially excited about embracing new technology. She believes that conducting research to thoroughly evaluate emerging techniques helps to further the science of medicine as well as best serve our patients. Time-lapse imaging: clearly useful to both laboratory personnel and patient outcomes versus just because we can doesn't mean we should. Trends of Socioeconomic Disparities in Referral Patterns for Fertility Preservation Consultation. Am J Clin Nutr. 2007 Jul;86(1):92-9. Curr Opin Obstet Gynecol. 2005 Oct;17(5):466-70.